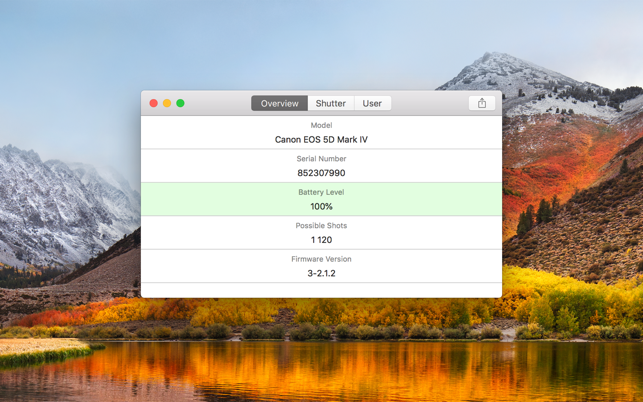 ShutterCheck displays a hidden information about your Canon EOS camera, so you can easily check whether or not a camera that is listed as new is really brand new or determine the value of a previously used item in order to make deals with more confidence. Important details about your camera, such as serial number, battery charge level, possible shots and firmware version, are presented as soon as you connect your camera via USB cable. 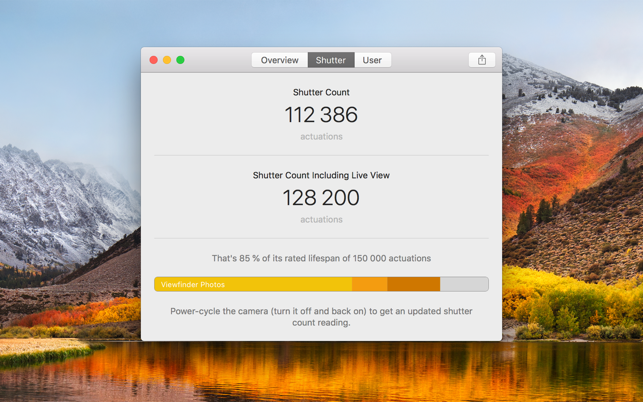 ShutterCheck reads and decodes shutter information directly from the internal memory of your camera. For newer Canon EOS models such as the 1D X Mark II, 5D Mark IV and 5DS the app displays an extended shutter information. Together with plain shutter count you’ll get separate values for photos taken through the viewfinder, photos taken via the Live View and a number of Live View sessions. All these values are presented visually on the detalization bar. What shutter count is considered too high? Turns out it depends on a camera model! Entry-level DSLRs like EOS 100D and 760D are usually rated for something about 100,000 actuations while professional-grade cameras such as EOS-1D X Mark II can go up to 400,000 guaranteed clicks! ShutterCheck displays shutter count along with a shutter’s rated lifespan so you can easily see the percent of its wear. Depending on a concrete model, Canon EOS cameras support up to three user-customizable fields that are used to populate metadata of your photos. 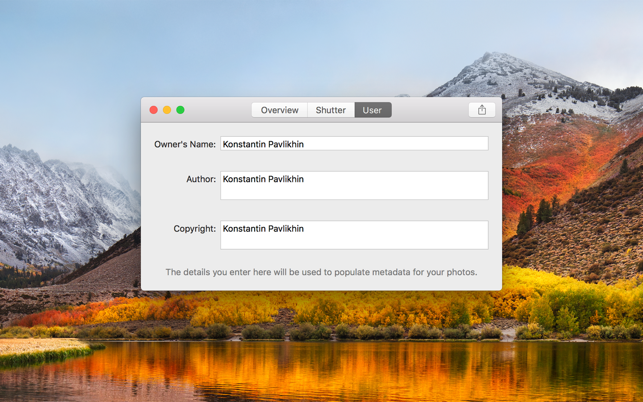 ShutterCheck gives you a convenient way to change owner, author and copyright settings of your camera. Use ShutterCheck to determine the value of your Canon EOS camera, so you can offer it for a realistic price. Your potential buyers will ask you for your shutter count anyway. 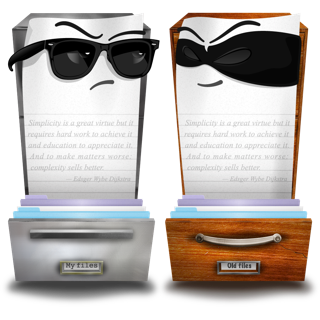 Give them this valuable information ahead of time to make a quick and hassle-free deal! Use ShutterCheck to figure out whether or not the camera that is listed as new is really brand new or estimate/verify the value of a previously used item. Ask the seller to send you ShutterCheck Camera Report that includes a shutter count info to make sure you buying an item in a good condition. Use ShutterCheck to track different cameras usage to predict failures and estimate costs related to shutter mechanism replacement in future. 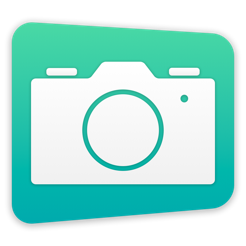 The app is available at a flat price: you purchase the app once and then free to use it with as many cameras as you need. Make sure that Wi-Fi is disabled if you have a Wi-Fi capable camera (such as EOS 6D and 70D). Active Wi-Fi interface completely disables camera’s USB communication abilities. Make sure that no other application on your Mac is trying to access the camera at the same time. Look for Image Capture, Aperture, Lightroom, EOS Utility and so on. Simultaneous access has unpredictable behaviour — both applications may not work properly. Tut genau was sie soll! Auslesen der Auslösungen von EOS 60D und EOS 6D Mk II funktionierte ohne Probleme. Ich meine, 3,99 EUR sind für den Funktionsumfang zwar etwas viel. Aber im Gegensatz zu kostenlosen Tools für Windows funktioniert es einwandfrei. I needed a tool that could read out shutter counts for my newer EOS models. Everything worked fine! I just tested and read out 2x 5D MK IVs, 1x 5D MK III and 1x 6D Mk I. Recommended for every Canon shooter! But make sure not only to switch off Camera-Wifi, but to remove any Wifi-SD cards too. Won’t work otherwise.